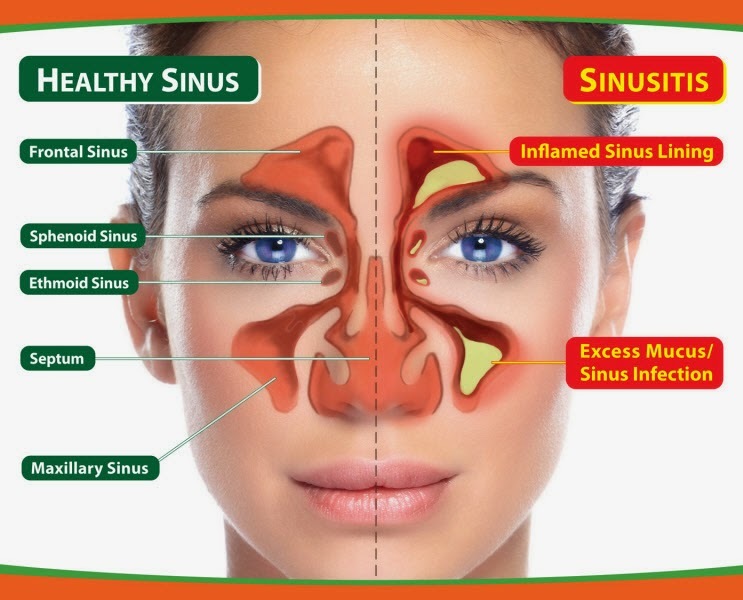 Acute sinusitis is a transient inflammation of the lining of the nasal sinuses (hollow space or cavities) mostly due to infection of the upper respiratory tract is termed sinusitis. This is in most cases, due to infection of the upper respiratory tract. If the infection is severe and the patient’s resistance is inadequate, one or more sinuses may become acutely inflamed. Oedema of the lining membrane narrows the cavity, and the ciliary activity may fail to clear the sinus of inflammatory exudates. If the cavities become completely blocked, pus collects under pressure in the sinus. The disease may also result in bathing in fresh water, when infected material is driven into a sinus and is often causes acute and dangerous frontal sinusitis. Mild feelings of heaviness in the face and head, made worse by bending toward sand copious discharge from the nose. If the ostium (mouth of the cavity) is blocked, the pain becomes continuous and intense, while the nasal discharge diminishes. Often the infection causes toothache in the upper jaw on the affected side. Ethmoid (body structure above the septum) and frontal sinusitis causes pain above, around and behind the eyes and in severe infections, oedema of the lids may completely close the eyes. On examination one finds tenderness over the inflamed sinus and pus in the middle meatus (channel) of the affected side and in the postnasal spaces. X – Rays show thickening of the lining of the membrane and either a fluid level or, if the ostium is blocked, complete opacity. Ethmoidal and frontal sinuses may lead to osteomyelitis of the frontal bone, meningitis, cerebral abscess, orbital cellulitis or cavernous thrombosis. Kali Iodide; Nitric acid ( syphilitic taint).